The Cayman Islands have more registered businesses than people. According to the Economics and Statistics Office of the Government of the Cayman Islands, the Cayman Islands has a population of about 64,420 as of spring 2018[update]. In 2016, the Cayman Islands had an estimated population of about 60,765 according to the United Nations, representing a mix of more than 100 nationalities. Out of that number, about half are of Caymanian descent. About 60% of the population is of mixed race (mostly mixed African-European). The islands are almost exclusively Christian, with large numbers of Baptists, Presbyterians and Catholics, but also hosts Jewish, Muslim and Hindu communities. 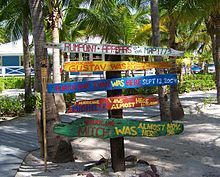 The vast majority of the population resides on Grand Cayman, followed by Cayman Brac and Little Cayman, in that order. The capital of the Cayman Islands is George Town, on the southwest coast of Grand Cayman. The Cayman Islands are a British overseas territory located in the Caribbean that have been under various governments since their discovery by Europeans. Christopher Columbus sighted the Cayman Islands on May 10, 1503 and named them Las Tortugas after the numerous sea turtles seen swimming in the surrounding waters. Columbus had found the two smaller sister islands and it was these two islands that he named "Las Tortugas". Government of the Cayman Islands takes place in a framework of a parliamentary representative democratic overseas territory, whereby the Premier is the head of government, and of a two-party system. Executive power is exercised by the government. Legislative power is vested in both the government and the Legislative Assembly. The Judiciary is independent of the executive and the legislature. The three islands of the Cayman Islands are the exposed top of an underwater mountain. Underwater, the sides of this mountain are quite steep, vertical in some places, within as little as a few hundred metres from shore. George Town is a city situated on Grand Cayman island of the Cayman Islands. It serves as the capital of the Cayman Islands, in the British West Indies. As of 2007, the city had a population of 28,836, making it the second largest city of all the British Overseas Territories. The Legislative Assembly of the Cayman Islands is the unicameral legislature of the British Overseas Territory of the Cayman Islands. It is composed of 21 members; 19 elected members for a four-year term and two members ex officio. The Hon. William Warren Conolly, OBE, JP was a politician and attorney in the Cayman Islands. Bodden Town, Grand Cayman, is the former capital of the Cayman Islands and centre of the largest district in the Cayman Islands. It is situated on a natural harbour and a coral reef. The first settlement was named after a government leader, William Bodden. Once ravaged by pirates, this village is known for its remains of a 4 mi (6 km) wall and cannon. Bodden Town has a population of 10,341. 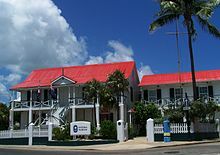 Its top attractions include the Mission House, which features the lifestyle of early Caymanian settlers. Bodden Town is also considered the fastest growing district in the islands in terms of resident population. The Cayman Islands, a British Overseas Territory located in the western Caribbean Sea, came under British control in 1670, as a dependency of Jamaica, continuing in that status until 1962.